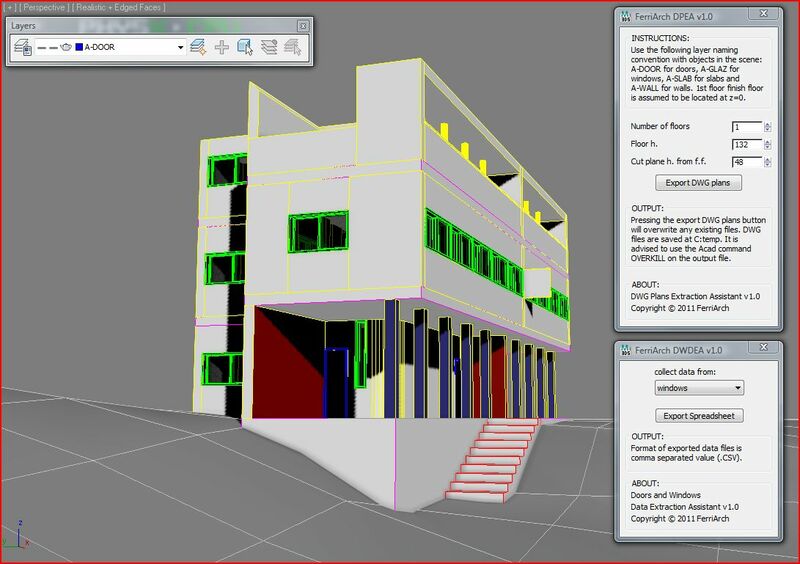 The "3ds Max as BIM" project is an educational tool used to implement Building Information Modeling features within 3ds Max. Current release includes: DWG Plans Extraction Assistant, Windows and Doors Attributes Assignment (u-factor, fire rating etc...), Windows and Doors Data Extraction to Spreadsheets and walls/slabs/stairs volume data export for material takeoffs. Download the archive and follow the instructions contained in the readme file. Extract maxscript files and execute them from the maxscript menu or open in maxscript editor, select the code and drag it to a toolbar to make it one of you favorite macros. The compressed archive includes a sample MAX 2010 file with standard layer scene organization that can be used for testing the scripts. I hope you will enjoy using 3ds Max as BIM! Submitted by ahmedrc25 on Wed, 2015-05-20 15:26. We are trying to run DPEA V1.0 but show some issues "IsolateSelection.EnterIsolateSelectionMode()". Could you help us? Submitted by FerriArch on Mon, 2013-10-21 08:24. Thank you obaida for your compliments and feedback. I think the best foreseeable development would be to see the 3dsMaxAsBim tools integration within 3ds Max Design, similarly to scripted plugins like AEC objects. Submitted by obaida on Mon, 2013-10-14 02:22.
its a huge work thank you for making it free , but i think if you merge this scripts with another plugins like (FuturArch) it will be better cause this plugins have the ability to build , so if you merge your info with its element maybe we will have a (Full construction and BIM System), and that will be more usable . Submitted by FerriArch on Thu, 2013-09-19 13:00. This is just a note to confirm the scripts compatibility with 3ds max design 2014. Enjoy! Submitted by FerriArch on Fri, 2012-06-15 13:00.
version 1.1 now compatible with release 2013 and videos! After fixing issues with the new isolate tool and editText, version 1.1 is now fully compatible with 3ds Max 2013. A video has been uploaded showing 3dsMaxasBIM in ACTION! Submitted by FerriArch on Wed, 2012-06-13 14:43. The new archive includes a walls/slabs/stairs volume calculator to export volume data to CSV for material take-off calculations. Other bug fixes and improvements were also included in this release. Submitted by FerriArch on Fri, 2011-12-09 09:49. Submitted by FerriArch on Thu, 2011-12-08 10:09. The collection of scripts has been updated including a Custom Attribute Assistant script featuring a UI and new functionalities (assign and Delete CAs from selected objects) to the former Door&WindowCA script. Submitted by FerriArch on Sun, 2011-12-04 14:45. Make Layers updated to fix an error with scenes already containing A-LAYERS. Submitted by FerriArch on Thu, 2011-12-01 22:51. Windows and doors custom attribute assignment and extraction added. Improved format of windows and doors data export.